To process Open EDI Sales Orders, use the standard SAP Business One Sales Order window and follow the instructions below. Open Sales Orders can be selected for processing as described in Open Sales Orders. The following table defines Sales Order Header fields, which are updated when an EDI Sales Order is loaded in SAP Business One. These fields are described below. Note that these fields also apply to the processing of Delivery documents. Sales Order UDFs can be used to process the order, as described below. Expand the details below for a detailed description of the fields used in SAP Business One documents Sales Order, Delivery or Invoice. Customer CardCode Text This field identifies the SPS Trading Partner, as identified on the EDI PO (850). It is matched with the Trading Partner ID field (U_ZSPS_TPID) on the Business Partner Master Data. Customer ref. No. NumAtCard Text Loaded from EDI PO (850). This field is mandatory for processing EDI Invoices (810) without an EDI PO (850). Ship-To Address Address2 Text Loaded from EDI PO (850) if on 850. Otherwise SAP Business One default is used. Bill-To Address Address Text Loaded from EDI PO (850) if on 850. Otherwise SAP Business One default is used. Freight - Allowances Various fields Numeric Loaded from EDI PO (850) if on 850 and SPS Use Allowances on the BP Master Data (U_ZSPS_Use850All) is set to Yes. Freight - Charges Various Fields Numeric Loaded from EDI PO (850) if on 850 and SPS Use Charges on the BP Master Data (U_ZSPS_Use850Chg) is set to Yes. SPS Trading Partner Id U_ ZSPS_TPID Text Loaded from EDI PO (850). Note: This field is mandatory for processing EDI Invoices (810) without an EDI PO (850). Warehouse Number U_ZSPS_DepoOrdNum Text Loaded from EDI PO (850). Identifying number for a warehouse shipping order assigned by the depositor. Reference only. Document Purpose U_ZSPS_TsetPurposeCd Text Loaded from EDI PO (850). 00 = Original Order (R1.00 supports only 00). Reference only. PO Type U_ZSPS_POTypeCode Numeric Loaded from EDI PO (850). PO Type Description U_ ZSPS_POTypeDesc Text Loaded from EDI PO (850). Order Type U_ZSPS_BlanketRef Text Loaded from EDI PO (850). PO Date U_ ZSPS_PODate Date Loaded from EDI PO (850). PO Time U_ ZSPS_POTime Time Loaded from EDI PO (850). Contract Number U_ ZSPS_ContractNum Text Loaded from EDI PO (850). Invoice Type U_ ZSPS_InvTypeCode Numeric Loaded from EDI PO (850). Department U_ ZSPS_Department Text Loaded from EDI PO (850). Department Description U_ ZSPS_DeptDesc Text Loaded from EDI PO (850). Vendor Number U_ ZSPS_Vendor Text Loaded from EDI PO (850). Division U_ ZSPS_Division Text Loaded from EDI PO (850). Promo Number U_ ZSPS_PromoDealNo Text Loaded from EDI PO (850). Promo Description U_ ZSPS_PromoDealDesc Text Loaded from EDI PO (850). Terms Type U_ ZSPS_TermsType Text Loaded from EDI PO (850). Terms Period U_ ZSPS_TermsBDateCod Numeric Loaded from EDI PO (850). SPS Payment Terms Description U_ ZSPS_TermsDesc Text Loaded from EDI PO (850). Shipped Date U_ ZSPS_ShippedDate Date Loaded from EDI PO (850). Estimated Delivery Date U_ ZSPS_EstDelDate Date Loaded from EDI PO (850). Earliest Ship Date U_ ZSPS_EarliestShpDt Date Loaded from EDI PO (850). Latest Delivery Ship Date U_ ZSPS_LatestShpDt Date Loaded from EDI PO (850). Earliest Delivery Date U_ ZSPS_EarliestDelDt Date Loaded from EDI PO (850). Latest Delivery Date U_ ZSPS_LatestShpDt Date Loaded from EDI PO (850). Scheduled Delivery Date U_ ZSPS_SchedDelDt Date Loaded from EDI PO (850). Scheduled Ship Date U_ ZSPS_SchedDelDt Date Loaded from EDI PO (850). Requested Ship Date U_ ZSPS_ReqShpDt Date Loaded from EDI PO (850). Doc Due Time U_ ZSPS_DocDueTm Time Loaded from EDI PO (850). Earliest Ship Time U_ ZSPS_EarliestShpTm Time Loaded from EDI PO (850). Latest Ship Time U_ ZSPS_LatestShpTm Time Loaded from EDI PO (850). Contact Type U_ ZSPS_ContactTypeCd Text Loaded from EDI PO (850). Contact Name U_ ZSPS_ContactName Text Loaded from EDI PO (850). Contact Phone U_ ZSPS_ContactPhone Text Loaded from EDI PO (850). Contact Fax U_ ZSPS_ContactFax Text Loaded from EDI PO (850). Contact Email U_ ZSPS_ContactEmail Text Loaded from EDI PO (850). FOB Pay Code U_ ZSPS_FOB_PayCode Text Loaded from EDI PO (850). FOB Location Qualifier U_ ZSPS_FOB_LocQual Text Loaded from EDI PO (850). FOB Description U_ ZSPS_FOB_Desc Text Loaded from EDI PO (850). Weight U_ ZSPS_Weight Numeric Loaded from EDI PO (850). Volume U_ ZSPS_Volume Numeric Loaded from EDI PO (850). Weight Unit of Measure U_ ZSPS_WeightUOM Text Loaded from EDI PO (850). Volume Unit of Measure U_ ZSPS_VolumeUOM Text Loaded from EDI PO (850). Transportation Code U_ ZSPS_TransCode Numeric Loaded from EDI PO (850). Routing Description U_ ZSPS_CarrierRout Text Loaded from EDI PO (850). Special Instructions U_ ZSPS_SpecialInst Text Loaded from EDI PO (850). Packing Slip Note U_ZSPS_PackSlipInst Text Loaded from EDI PO (850). Loaded from EDI PO (850). Updated by SPS Commerce Cloud EDI Add-On. 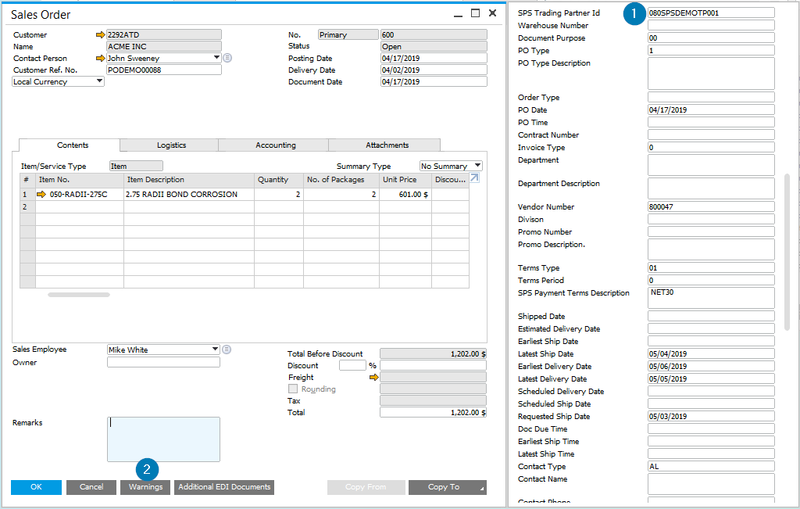 Expand the details below for field definitions of Sales Order Line fields which are updated when an EDI Sales Order is loaded in SAP Business One. Item No. ItemCode Text Loaded from EDI PO (850). The ItemCode is determined using the logic described in the Item Cress Reference section of this document. Quantity Quantity Numeric Loaded from EDI PO (850). Price Price Numeric Loaded from EDI PO (850) if the field SPS Use Price on the Business Partner Master Data (U_ZSPS_Use850Price) is set to Yes. Number of the line item ZSPS_EDI_LineNo Numeric Updated by Connector Add-On. Buyer's primary product id ZSPS_BuyerNo Text Loaded from EDI PO (850). Buyer's units of measurement ZSPS_BuyerUOM Text Loaded from EDI PO (850). Agreed price ZSPS_BuyerPrice Numeric Loaded from EDI PO (850). Type of unit price for an item ZSPS_PriceBasis String Loaded from EDI PO (850). Desc of the product color ZSPS_BuyerColor Text Loaded from EDI PO (850). Color primary description ZSPS_NRF_Color Text Loaded from EDI PO (850). Size primary description ZSPS_Size Text Loaded from EDI PO (850). Contact Name ZSPS_BuyerName Text Loaded from EDI PO (850). Requested Ship Date ZSPS_ReqShipDate Date Loaded from EDI PO (850). Estimated Ship Date ZSPS_EstShipDate Date Loaded from EDI PO (850). Retail Price ZSPS_RetailPrice Numeric Loaded from EDI PO (850). Retail Price - UOM ZSPS_RetailPricUOM Numeric Loaded from EDI PO (850). Product Description ZSPS_ProdDesc Text Loaded from EDI PO (850). Color Description ZSPS_ColorDesc Text Loaded from EDI PO (850). Size Description ZSPS_SizeDesc Text Loaded from EDI PO (850). To view all warnings associated with the validation of the SAP Business One Documents, press the Warnings button, marker 2 in the above screenshot. This will bring up the warnings screen shown below. Within the details, an error code is provided at the end of each message. Use this code to look up resolution instructions for each error in the Error Codes documentation. Warnings related to sales orders. Additional EDI Documents button which can be found on the sales order screen. For sales orders which originated from an SPS integrated purchase order, the “Additional EDI Documents” button will be shown. This button will open the default web browser and navigate to the SPS Portal. The customer purchase order number (Customer Ref No) will be used to find the related purchase order document in the SPS Portal. See Additional EDI Documents for more information.